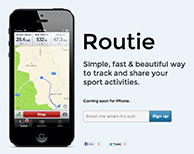 Routie 'coming soon' page is here! | Glimsoft Routie 'coming soon' page is here! Routie, the project that I have been working on for so long, investing a lot of my energy and time into it and kind of hoping that this will be ‘the thing’ that will turn the things around for me, and the thing that people will really love and use frequently, has finally its own coming-soon page! You can check it right here: routieapp.com. I will share more about it as soon as I’ll have something more to show you, but for now, that’s it. Cheers!